New design featuring all-metal mounting bracket and u-bolt attachment to mast. Special offer when purchased w/weather station or PRO Upgrade Kit. Measures WIND SPEED, WIND DIRECTION (click to see sensor), OUTDOOR TEMPERATURE (click to see sensor), INDOOR TEMPERATURE, WIND CHILL, TIME, DATE, OUTDOOR HUMIDITY (with optional sensor ), DEW POINT, AND HEAT INDEX; INDOOR HUMIDITY (with optional sensor ), and RAINFALL (with optional sensor ). You can reset each long term high and low memory individually or you can use use a MASTER RESET to clear all long term high and low memories simultaneously. This feature makes it particularly easy to keep monthly records, or to monitor the highs and lows while you are away for a week or two. 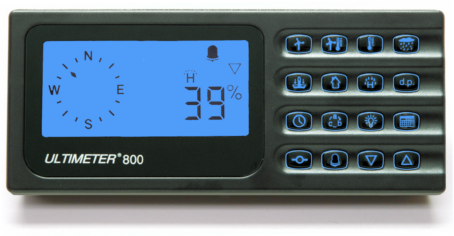 Optional sensors include Humidity Sensors and Rain Gauges (several models to choose from). 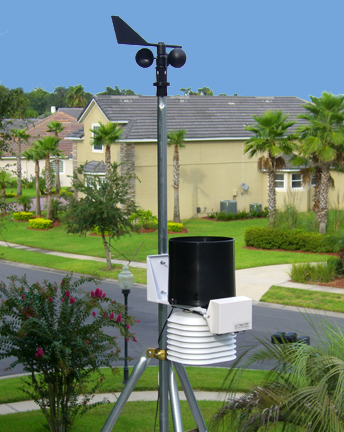 Perhaps you just need a basic weather station – wind speed, wind direction, outdoor temperature and possibly rainfall. Even so, you have every right to expect that your system will be just as reliable and accurate as the most elaborate top-of-the-line system. Rest assured that our ULTIMETER 800 uses the same top-quality sensors, including the incomparable ULTIMETER PRO Anemometer, featuring exceptional response in all wind conditions, including very low wind speeds (typical starting threshold 1.5 mph! here's why). It also features the same great data processing as our renowned 2100 system, including WeatherText® serial data output, and is APRS-ready. It is unsurpassed as a basic electronic weather station for the professional or serious amateur weather observer. For more information on how the weather station is configured, please refer to the ULTIMETER 800 Wiring Diagram. Includes ULTIMETER 800 Keyboard/Display Unit, ULTIMETER PRO Anemometer/Wind Vane (w/40' cable), Outdoor Temperature Sensor (w/25' cable), Junction Box (w/8' cable), AC Adapter (w/6' cord), Desk Stand and Wall Mounting Bracket for keyboard/display, and Owner's Manual.